Transparency Market Research has published a new report on the global lithium ion battery market. According to the report, the global lithium ion battery market stood at US$11.7 bn in 2012 and is predicted to reach US$33.1 bn by 2019. 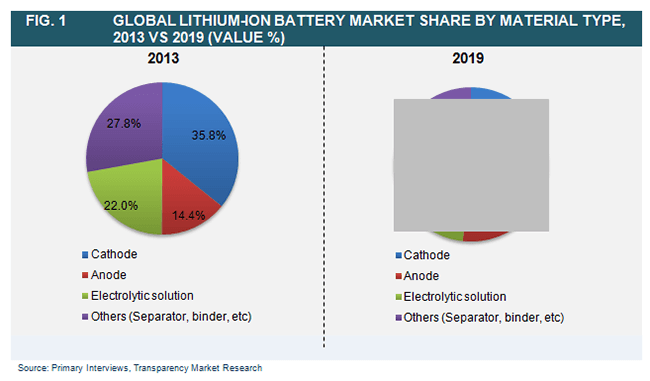 The report, titled ‘Global Lithium Ion Battery Market - Industry Analysis, Size, Share, Growth, Trends, and Forecast 2013 - 2019’, states that the global lithium ion battery market is expected to expand at a 14.40% CAGR during the period from 2013 to 2019. Lithium ion batteries are rechargeable and are available in various forms such as pouch and prismatic, large cylindrical, and small cylindrical. The demand for lithium ion batteries is predicted to register robust growth in the years to come. Increasing demand for lithium-ion batteries across various applications such as wind, automotive, military, and industrial is expected to boost the growth prospects of the global lithium ion battery market during the forecast period. At present, the global lithium ion battery market is driven by the usage of lithium-ion batteries in the automotive sector in trams, trains, and HEVs. Compared to traditional batteries, the application of lithium-ion batteries is expected to increase in the coming few years due to rising cost of fuel. In the years to come, lithium-ion batteries will be used as a replacement for lead acid batteries. The global lithium ion battery market is segmented on the basis of application, geography, and material type. Based on geography, the global lithium ion battery market is divided into Europe, North America, Asia Pacific, and Rest of the World. The demand for hybrid electric vehicles and electric vehicles has increased in the past few years and it is expected to increase further in the coming years. Electric vehicles are often powered by lithium-ion batteries. Additionally, increased fuel prices are expected to add to the demand for electric vehicles in coming few years. Asia Pacific is expected to lead the global lithium ion battery market in the years to come, followed by Europe and North America. Energy requirement of buyers of electronic devices will continue to grow during the forecast period. High graphic support in smart devices such as smartphones and tablet PCs has increased the consumption of batteries. Growing energy requirements are expected to generate more opportunities for the global lithium ion battery market. The leading players in the global lithium ion battery market are well-spread across the globe. With the increasing number of new entrants in the global lithium ion battery market, the leading players are expected to face high competition in the coming few years. Some of the prominent players in the global lithium-ion battery market are Automotive Energy Supply Corporation (AESC), GA Yuasa Corporation, Johnson Controls, Inc., Panasonic Corporation, Toshiba Corporation, China BAK Battery, Inc., A123 Systems LLC, and Hitachi Chemical Co. Ltd. Some of the factors restricting the growth of the global lithium-ion battery market are the high cost of lithium-ion batteries and lack of awareness about the advantages of using lithium-ion batteries. The fact that lithium-ion batteries can explode in high-temperature conditions is expected to hamper the growth of the global lithium-ion battery market. However, technical advantages are predicted to eliminate the risk of using lithium-ion batteries, thus boosting the global lithium ion battery market.